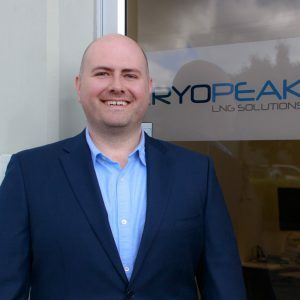 Robert is a project management professional with extensive experience in the LNG small scale and marine oil and gas industries. He has a comprehensive understanding of risk management, safety management systems and operations management. His analytical capabilities and diverse skill base have been forged over 10 years working in both large and small capital projects often in challenging environments. Previous to Cryopeak he managed complex projects ranging between $50 million and $1.5 billion dollars whilst at Teekay Shipping. As a project services manager at Teekay Robert’s responsibilities included developing a new management system for all company projects, leading a project control team for a floating storage and offloading conversion project, oversaw the construction of a shipyard building contract in China ensuring project task where completed safely and efficiently. Robert is a designated project management professional (PMP) from the Project Management Instute and trained in the Incident Command System – ICS300, Risk Management through ESI International, ISO9001:2008 as a Lead Auditor through the British Standards Institute and Risk Management and Incident Investigation through Lloyd’s Register.